to visit them and sample the British treats we couldn't get in Italy: cheddar cheese; Cadbury's Minirolls; Madame Tussaud's; the double decker bus (top floor of course) and Brent Cross shopping centre! Unlike my sister, who always felt more at home in Italy, I was always strangely more drawn to Britain (London in particular) which is where I ended up moving to for University and subsequently, drama school. Being in Italy, my school didn’t show much promise in terms of producing theatrical events and we certainly didn’t have drama as a subject we could choose. We did however have music lessons. And it was during these music lessons that I developed my passion for performing. It was my music teachers Mr George and Mr Barthel who encouraged me and pushed me. As must be the case with most children who have been introduced to musical theatre, Andrew Lloyd Webber’s ‘Joseph...’ was my first performance; a concert version and I was cast in the title role with Mr George diligently making sure I was looking after my voice at every opportunity. I remember the evening as a big success or at least through the eyes of a 12 year old boy it had seemed a triumph and now we’d tasted success we wanted more. “What about next year?” Enter Miss Campbell, a vibrant new teacher with an accent as strong as her feistiness and more importantly, experience in directing!! She teamed up with Mr George in preparation for the next project. This was going to be, by far, the biggest production the school had ever seen and my first experience of auditioning. 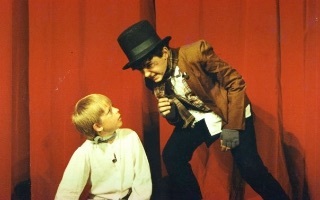 The show....‘Oliver! 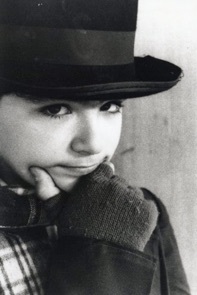 I remember there was a dispute over who to cast me as; Mr George thought I should play Oliver whereas Miss Campbell thought I was more suited to the Artful Dodger. This was a tug of war which unfortunately I’ve seldom experienced again in the real world. Miss Campbell won, and we ended up having a boy for the role of Oliver who looked much more angelic than I ever would have! s of the auditorium and of course the magnificent proscenium framing the plush red velvet curtains. It was like something you would expect from an old fashioned movie recreation.....and it was perfect! As the house lights faded, the conductor took his place and then.. MAGIC. My mum recounts how she couldn't bring herself to watch the stage as she was mesmerised by my reaction. Apparently, as the music started, I sat forward in my seat and gazed in amazement over the front of the box. Then, as the curtain lifted to reveal the stage, my face lit up and I was gone. I obviously don't know what I looked like but I do still remember the feeling I had; it was like a wave of magnificence had overpowered me, unlike anything I had ever felt. I also remember being completely entranced by it all; my parents could have walked out mid performance and I wouldn't have know.